The Camera Shop can copy your video tapes to DVD. 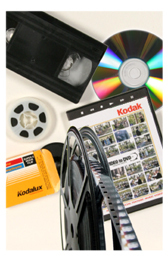 We can often combine several of your original tapes onto one new DVD or VHS tape. For best quality, we limit the total length to 2½ hours of total footage. Note that most copyrighted material cannot be copied unless accompanied by a written copyright release signed by the copyright owner. Click on the Price Page link for complete details about our Video Duplication Service. If you need multiple DVD or VHS copies produced, please contact us for a price quote.